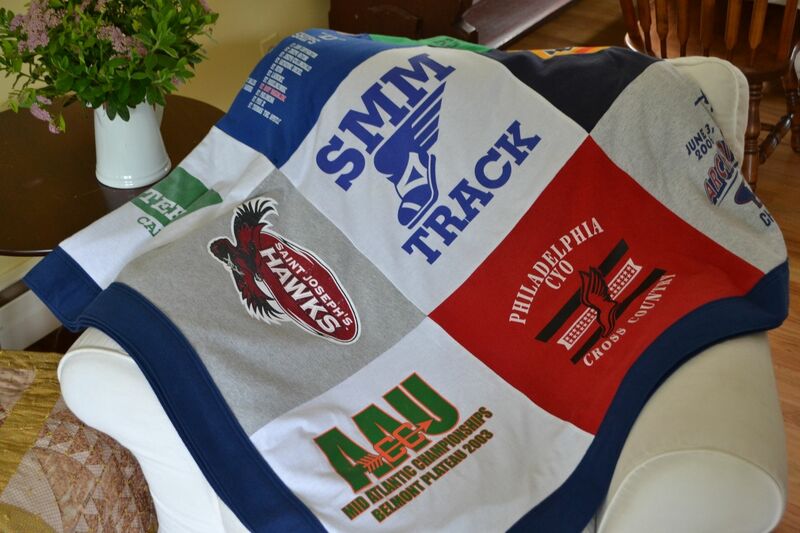 Custom Memory Blankets can be made from just about any fabric including, but not limited to, t-shirts, jerseys, golf shirts, pj's, button-downs, jeans, pants, sweaters, and baby clothes. Everyhing that is important to you will be on your blanket. Smaller pieces such as ties, hats, patches, etc. can be added. Your blanket will be backed in a pre-washed heavy flannel, making it soft and cozy. The backing wraps the sides, creating a beautiful wide border and is triple-stitched for durability. 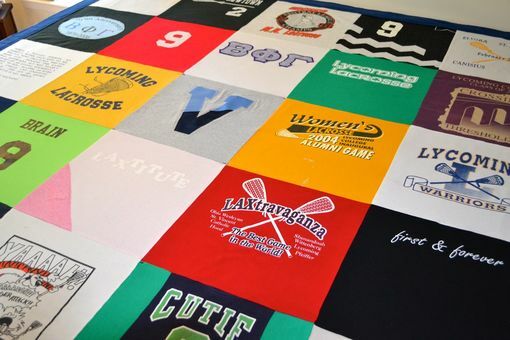 Your squares will be custom-cut to ensure all logos and designs are nicely visible and your blanket will be laid out in an eye-pleasing design. One "square" may include more than one piece of clothing and all smaller pieces, patches, etc. will be appliqued onto your blanket. Our blankets can be made with all designs facing the outer edges of the blanket or in a wall-hanging style with all designs facing in one direction. Flannel backing choices may include navy, pewter gray, garnet red, chocolate brown, forest green, pale green, light blue, rose, purple, tan, cream, and white. All flannel is pre-washed and dried. Monogramming is available for an additional $15 per name.